The children have learnt how to play chess. And one relearns Ludo with them. Now there are many things which they know. Spellings. Multiplication tables. They sit at Crosswords and spend many lovely hours reading. “How many games will you win if I play with you,” a potential employer had once asked the young job-seeker. “All” he had replied. They played three games and he won all three, and also got a job. 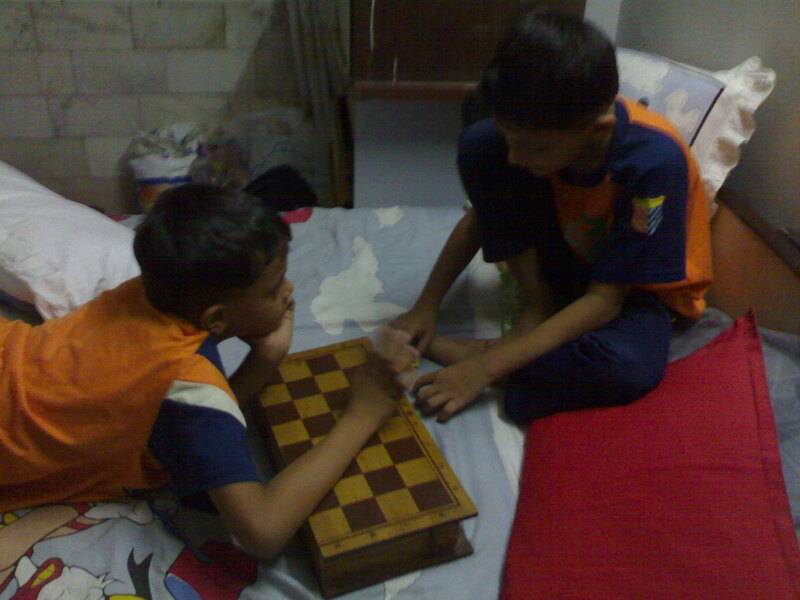 That is their Bharat Mama (now doing IT in New Jersey) who taught them to play chess. Lucky to have such a brilliant person introduce them to Chess. “Who knows multiplication tables till 20” my class 4 teacher in St.Vincent’s Pune had once asked us. Only two of us knew them and I was one of them. Now Sahil, studying in third standard said he could tell the tables till twenty. I could not believe it. But he did. Sitting on the train to Delhi I tried to challenge his limits a bit further. How much is 27 x 27? He took some time, but told me the correct answer. Children are getting smarter. This is my children showing me how to use their Encyclopedia. Learning from one’s children..of the processes and joys of childhood, growing, living. This is my children showing me how to use their Encyclopedia. Learning from one’s children..of the processes and joys of childhood, growing, living. Walking through Flora fountain Bombay area, where one finds many interesting books, like the Sunday Bazaar of Daryaganj Delhi. I was told by whining elder son Sagar that he had only five of the ten books suggested as reading material by his Class 4 teacher. I tried to find them, but was not successful. “Go to the bookstores at Girgaum Chowpatty and find these titles” one experienced bookshop owner and lover of books at Kalbadevi opposite Metro cinema suggested to me as I tried to see where I could find the remaining five books. When I was in Class 4, in St.Vincent’s Pune, I was first introduced to Charles Dickens, having been given a prize for standing second in class. “Oliver Twist” was the novel I first read, starting a lovely journey which has enriched life in many unexpected ways. Now, going through the reading list of Sagar, I felt happy, that he is on the same path, and going by the list he has got, will go much further than I can ever hope or imagine. They learn spellings which I cannot understand and then have to open Oxford dictionary to explain to them. The chess games have already developed into the nuances of what is a gambit. One feels a deep sense of joy, seeing their progress. This entry was posted in Learning and tagged Children, Learning, Parenting, Sahil. Bookmark the permalink. Reblogged this on grace readings .